Chocolate vices, from the bakery. Some will call this a minor indulgence. Some won’t say anything, they'll just smile. Everyone with a weakness for chocolate, flour and butter will know what time it is. 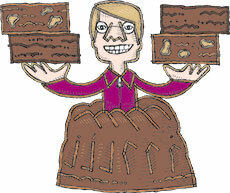 A nosher-sized Hot Cocoa Coffee Cake accompanied by four brownies: two Walnut-Studded Magic and two no-nut Black Magic.